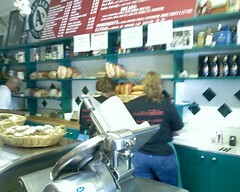 We love the American Italian Deli off of Main St. in Los Altos. It's such a great little place, with friendly people, fast service, and of course GREAT food. I'd say between all the people in our office we at least grab lunch there once a week, if not twice. So, if you've never been there yet you should definitely check them out. I personally prefer their "Godfather" sandwich, which is a hefty sub loaded with proscuitto, provolone, coppa, mortadella, and salami on a soft roll; but if that's not your thing they have loads of other stuff ranging from Gelato, to Italian Sodas, Salads, and Pasta. The American Italian Deli definitely makes a great choice for lunch and is just one of those small local businesses that stick out in the community. That really sounds like a good place to eat. Next time I'm in the area I might have to check it out.